I went to a conference in Barcelona in July, so I planned a week of mammal-watching in France and Spain. I spent an additional week traveling with my girlfriend in France, and I was able to fit in one day of mammal-watching in the Vercors Massif in the Alps. My most-wanted species were Iberian Lynx and Pyrenean Desman. I missed the former, but had excellent views of the latter. 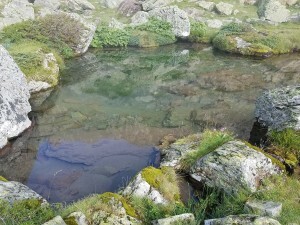 Most people I asked about the Desman indicated it was impossible, but a comment by Nicolas in response to my RFI suggested Lac d’Ayous high in Parc National des Pyrénées in France. Mélanie Némoz of Project Life+ Desman seconded this recommendation. As such, I decided to spend two nights at Refuge Ayous, a short walk away from the lakes. At Refuge Ayous, I met two mammalogists who had studied the Desmans in the area, and were back for a vacation. 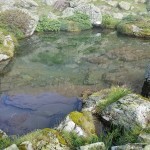 They told me that Desmans occurred in several lakes in the area, as well as the river one passes on the way up, but that the best site was a small, clear, slow-moving stream on the way to Lac Bersau. The visibility was certainly better there than in the other bodies of water. It rained the first evening, so I began my search at 3:00 AM the following morning. I had my first brief views of my target after only about an hour of spotlighting. It appeared to be afraid of even my red light, and quickly swam to the bank and disappeared. I resolved to observe it during the daytime. The researchers told me that Desmans have small territories and high site fidelity, and recommended a stakeout. 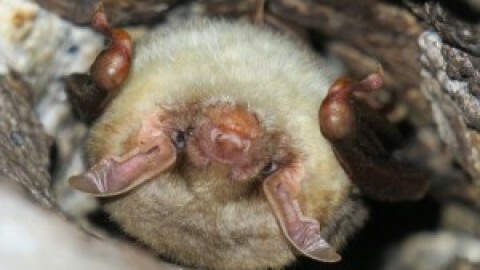 Radio tracking data from a lower elevation site indicated that while significantly more active at night, Desmans are have short periods of activity during the daytime separated by about four hours of rest. 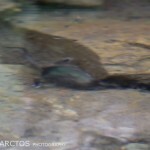 However, some of the active time may be spent under rocks or vegetation. After a stakeout that lasted most of the day, I was fortunate enough to observe Pyrenean Desman on-and-off for about ten minutes. It fed by moving its trunk back and forth quickly along the streambed and between rocks, often producing small clouds of suspended matter. It swam with great agility, and never left the water. 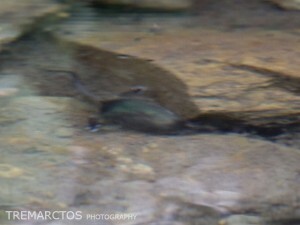 It disappeared under the rocks at the bank of the stream several times, only to reappear a short while later. My attempts at a good photo were hindered due to the Desman’s speed and (more importantly) the fact that it was underwater. 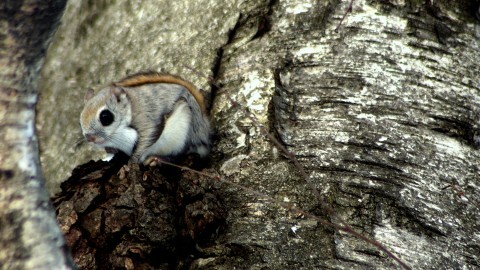 I did manage to get a couple record shots, one of which is included here. The exact coordinates of my sighting are 42.842223, -0.494622. I also observed Isard/Pyrenean Chamois (high on the slopes, with very young calves), Alpine Marmot (introduced), Lammergeier, and Pyrnenean Brook Salamander in the same area as the Desman.The Desman searching strategy I would recommend is walking slowly along the small stream between Lac Bersau and the climb down to Refuge Ayous, concentrating on the small pools where the water moves slowly. They are active infrequently, but should be seen with enough time due to the excellent visibility. Afterwards, I drove several hours south to Andujar, to search for Iberian Lynx. 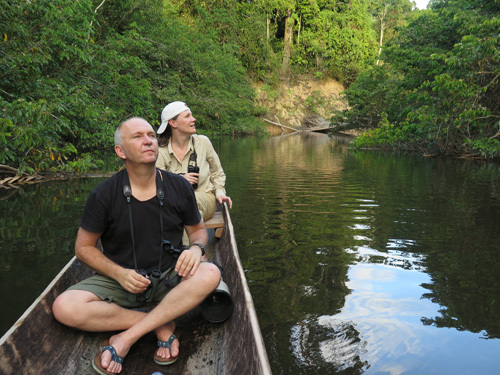 I spent 3.5 nights spotlighting, along both the La Lancha and Encinarejo tracks, without success. I also scoped from the viewpoints for a few hours. In retrospect, I should have spent more time scoping, but it is worth noting that I met only one other group of Lynx watchers (as opposed to up to 80 in the winter). Also, Lynx activity is lower in the summertime because European Rabbits, their main prey, are far more abundant. Despite missing Lynx, I did see European Otter (Encinarejo), Common Genet (La Lancha), Red Fox (including a den visible from the road before Los Escoriales), Wood Mouse, Garden Dormouse (easily seen spotlighting by foot), Mouflon (La Lancha and near Los Escoriales, only males), Wild Boar, and many Red and Fallow Deer. The logistics of visiting Andujar are well documented in other reports, but I should mention that I stayed at La Caracola, which was very nice. 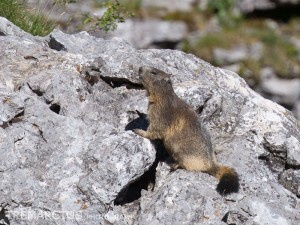 I also spent a day mammal-watching in the Vercors, near Grenoble. Jon recommended I contact Gilles Trochard (gilles.trochard@wanadoo.fr) and Philippe Lloret (lloretphilippe@hotmail.com); both were very helpful and provided useful information. They work as guides in the area, and I can recommend both of them. The most reliable summertime site for Alpine Chamois might be Port d’Urle, which was recommended by both Gilles and Philippe. Park at Hôtel Restaurant Les Dryades, and hike straight along the path until you reach a large cliff. 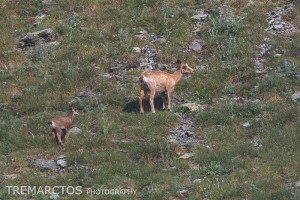 I saw several distant Alpine Chamois at the base of the cliff, between 8:00 AM and 11:00 AM. I also saw many Alpine Marmots in the boulder field that one passes on the way to the cliff (on the left), and a Wallcreeper on the cliff face. On Gilles’ recommendation, I stayed at the very nice Hotel Bellier (http://hotel-bellier.com/). 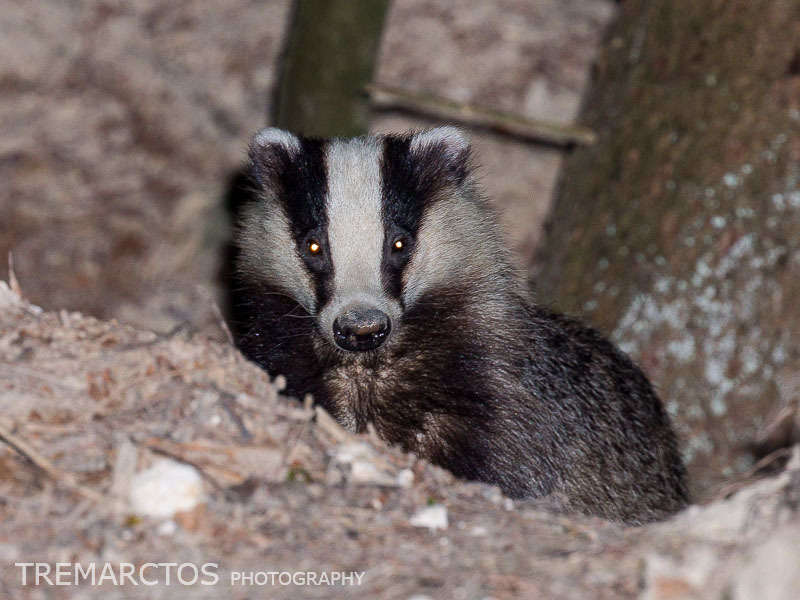 He gave me directions to a nearby Badger den, where my girlfriend and I had excellent views of a mother with two cubs. I also drove around for a bit, concentrating on an area Gilles suggested for closer views of Chamois. I saw one, plus many Roe Deer, two Red Deer, a Red Fox, and a Beech Marten. P.S. 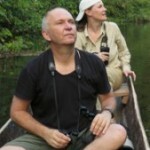 I’m still planning to write a Sierra Leone trip report, and I hope to find the time to do by the end of next month. Great work on the Desman Ben. This sounds like the first reliable site for this much wanted species that we have. Well done on the Desman sighting Ben. That’s a species I’ve wanted to see for a long time, but never had a reliable location; I know where I’ll be going next summer! Pity about the lynx, although this summer was scorching in Spain, so I’m not surprised they didn’t show. If you return just make sure you avoid the pilgrimage in April, otherwise you’ll be sharing the area with half a million people.